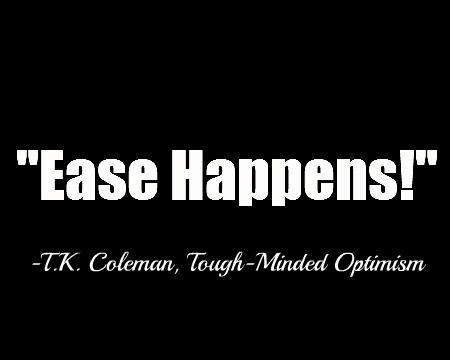 BlogHome » Blog » Ease happens! Sometimes we resist the path of least resistance because of a belief that life must always feel resistant. The willingness to be strong, work hard, and defy our obstacles is noble (and necessary), but it’s also important that we learn how to recognize and receive life’s blessing when they’re offered to us. Be tough enough to overcome the hate, but don’t be too tough to let in a little love. Be strong enough to fight for what you believe in, but don’t put up a fight when someone tries to do something good for you. Yes, life does throw curveballs, but not every single pitch. The universe is filled with grace–opportunities and options that we’ve done nothing to earn or deserve. Sometimes, things just work out. Sometimes, the doors just open for us. Sometimes, the mean person is nice. Sometimes, the difficult situation is easy. Sometimes, the traffic isn’t so bad. Sometimes, we get a few breaks. It’s not always easy to let ourselves have it easy, but sometimes you just have to go with the flow–even when it feels smooth.